Sometimes we are all blinded by a fact or performance out of the ordinary. It is true that the technical quality of a Pogba or the speed and youngster like Mbappe are great to see, but this type of player is sometimes overrated. The last two (as examples) are among the most expensive players in history but if you look at their average performances, it’s not that good. For the moment, Sergej Milinkovic-Savic is not that kind of player but almost the contrary. Born in Spain where his father was a football player, he started his career in the youth academy of FK Vojvodina (Serbia) as a midfielder. After climbing a stage by signing to Genk in 2014 where he scored five goals in 24 appearances, he quickly joined Lazio the following year. Since this time, he is one of the architects of his team with an average of 36 appearances per season. 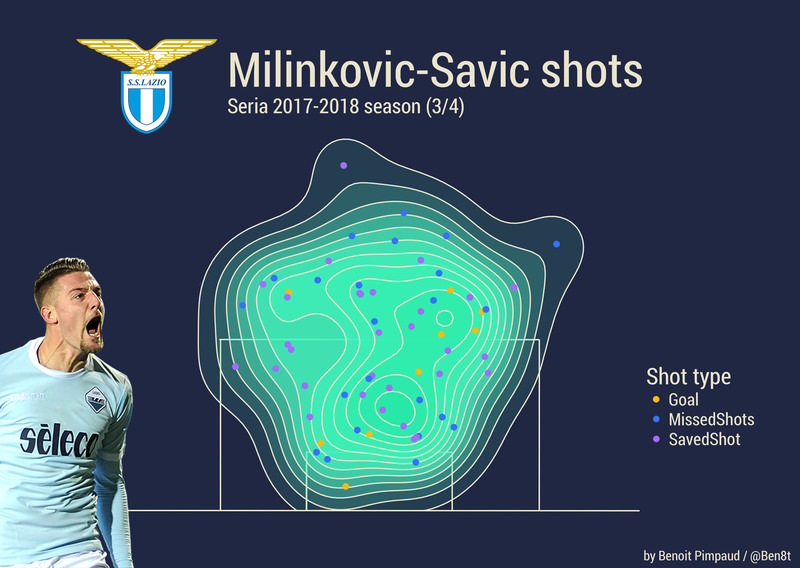 What is very interesting in Milinkovic-Savic is that he is a unique player. Without looking at his games, some would compare him as Nemanja Matic: in fact, there are just similar in their nationalities and their sizes. He is not really a defensive midfielder – some might see him even as an attacking midfielder. Really emerging over this last season, he’s played in the special 3-5-2 from Simone Inzaghi (Filippo’s brother) alongside Lucas Leiva (the true defensive midfielder) and Marco Parolo. Alternatively, while he has an appetite to go forward, he sometimes plays higher on the pitch with Lazio playing in 3-4-2-1 as we can see on the passnetwork below. A lot of people compare him with Paul Pogba when the Frenchman was at Juventus. In fact, it’s not just in the tactical position that these two players are alike. Where the comparison with Pogba is stronger is when we look at technical and physical skills. Like Pogba, he is very tall (1.91 meters), allowing a good aerial presence both in attack and in defence, thanks to his positioning. But what is very surprising when you first look at him is how he is easy with the ball. With an unbelievable sense of the game, he makes us think another time of Pogba in the way he dribbles and he gives balls (either short or long pass) to his teammates. However, we must not forget the tactical aspect: this liberty of play is possible thanks to Lazio’s tactics. With Lucas Leiva behind him and Parolo more as a box-to-box player, Sergej has all rights in the attack. Moreover, it’s even easier when he comes back in defence with his team formed by five defenders. Looking at shot locations from the beginning of the season show how he can be a very offensive player. With nine goals and two assists this season, Milinkovic-Savic as very good statistics for a midfielder at such young age (23 years old). However, the comparison with the Manchester United midfielder is lighter when we look at contribution all over the pitch and not only in creative areas. With an average of 3.5 aerials won per game, he is also a strong man able to gather the ball in difficult and dangerous areas. However, this is wasted by weak discipline, stupid fouls and being dispossessed too many times in some games. We can probably say that this is due to his young age but high level is exigent and it’s probably for that reason that big clubs are waiting to consider him as a serious purchase. After three great seasons with Lazio, the Serbian will probably leave Italy if a big club comes to find him. He has an interesting profile for teams looking for a strong midfielder able to play in different positions. Chelsea, Manchester United, Liverpool and Arsenal are onto the midfielder and they will probably wait for the World Cup to see if he fits with what it’s expected at very high level. During the summer, Serbia could be an outsider with quite a strong squad. Moreover, they are not in a “fire” group playing against Brazil, Switzerland, and Costa Rica.